Cozy Quilt Designs has a new line of patterns called Sew Chick! 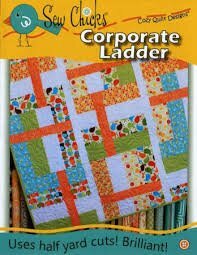 Sew Chick's Corporate Ladder is an easy and fun quilt that starts with your favorite half yard cuts. It strategically places your background and accent to make nice big blocks. It comes together quickly and will add a beautiful pop of color to your living room couch. The sky is the limit for your creativity. You can use any type of fabrics from modern to conversational to children's fabrics, or even flannels!